Kodie had another check-up and xray at the start of June and it came back clear for Kodie so that was great. The check-ups are now a little further apart which I’m assured is a good thing. We recently went to Centre Parcs as a time away to recoup and spend much appreciated family time – just me and my three boys. Kodie got to do some football which he loves. Kodie’s having physio on his legs for his leg pains he was getting and this seems to be working which is great. How I found out was very strange. 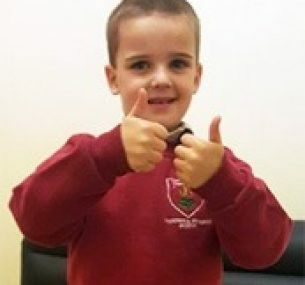 Kodie had problems with his bowels and needed to take Movicol every day to help him go to the toilet. So it wasn’t unusual for him to have a swollen tummy. One night Kodie woke up crying – he was in pain and holding his left side. I gave him Calpol and booked him to see the doctor early the next morning. The doctor examined him and said she was concerned. She wanted him to go straight to hospital for scans. I still just thought it was a water infection or food poisoning. Kodie had ultrasounds done and we waited for the results. 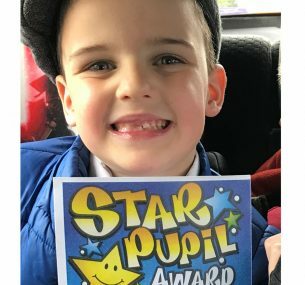 The doctors then took us to a room and gave us the devastating news: my little boy had a cancerous tumour – this would be confirmed with a biopsy. My world came crashing down. I cried so much. That was the one time I let it get to me. I then picked myself up and discovered a strength that I didn’t even know I had. 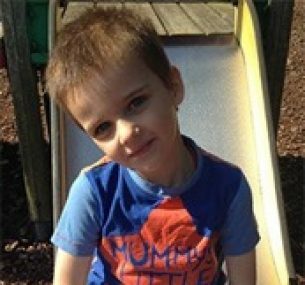 Kodie was transferred to Addenbrooke’s hospital where he had further scans and then a biopsy. He also had a Hickman line fitted for his chemo which he started pretty much straight away. When the biopsy results returned saying it was a Wilms’ tumour we were relieved. I know this sounds odd, but we finally knew what it was and now the doctors could treat it accordingly. 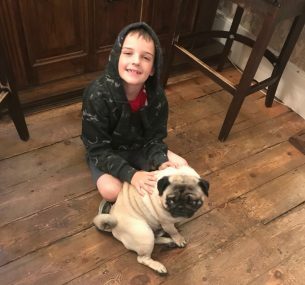 We were also told it was strange since Wilms’ tumours don’t normally cause any pain – so for Kodie to wake in pain that one night only was very odd. I still see this as having been a sign to tell us he wasn’t well. 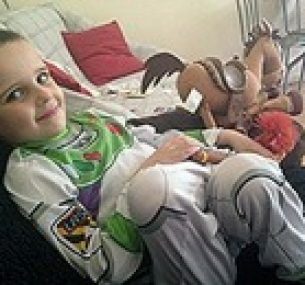 Kodie’s operation to have his kidney and tumour removed was booked in. It was to happen a few weeks into the chemo since the chemo would shrink the tumour and make the operation easier. It was the worst time of my life seeing my little boy in intensive care with all these tubes coming out of him. When the time came to have the operation Kodie was full of energy and it just didn’t seem fair. He was in the theatre for six and a half hours. Every minute felt like a lifetime. His operation wasn’t straightforward as his kidney and tumour had got stuck. Kodie lost lots of blood and had to have a blood transfusion. He was then taken straight to intensive care and sedated for a couple of days. It was the worst time of my life seeing my little boy in intensive care with all these tubes coming out of him. Once he came round from the sedation he was transferred to the ward. He recovered very quickly and his scar is so neat! Kodie was diagnosed with Stage 2 cancer. He had to have chemo for seven months in total. Thankfully his treatment is now finished and he’s in remission, which is great news. Kodie has been an amazing little boy. He’s been so strong and has never let things get him down. I couldn’t be prouder. We are very happy and trying to stay positive, because there is no other way to be. I’m so thankful for the doctors and nurses. What amazing people they are. Kodie has been in remission for nearly 10 months now. He has three-monthly check-ups which include a scan and x-ray. They will continue until he is 10 years old. This is to make sure the cancer hasn’t returned. It’s always a very tough time around the time of the scan and, as always, Kodie is so laidback and takes it in his stride. His next scan is coming up and I’ve got that dreaded worry in my stomach I always get. But we have to think positive. Kodie is strong and amazing and makes me the proudest mum. Kodie is still having regular scans although he is now down to one every six months which is another positive step. Kodie is growing into an amazing, handsome, energetic little boy and I couldn’t be prouder! He’s got loads of friends and is such a sociable little boy. Kodie is also now a big brother too as he has a baby brother who’s 11 months now. He’s such a good big brother and always gets his baby brother laughing.